The last couple of articles on the subject of securing executive jobs through the use of social media have covered what I think are more than compelling reasons for engaging in social (I’ll use social as a noun going forward) during your senior executive job search, and indeed using this approach into your next executive role and beyond. The most successful clients that we work with are those who engage in social, no wait – that’s not a strong enough phrase – The most successful clients are those who utilize social in a smart and credible way as an on-going integrated tool in their job search strategy. I could go further. Social should not be a quick fix, it can’t be. Truly engage and grow your network, give back, share your knowledge freely, demonstrate your leadership capabilities consistently, and you will begin to reap the benefits; it could be fast, it could take a few months, but by regularly practicing some (possibly new) social skills, you will be actively enhancing your career going forward, as well as becoming far more visible, hence easier to be found by recruiters, executive headhunters and hiring managers. It’s always about relationships, and many fruitful ones can be grown from online social interactions. I would certainly never have made so many friends across the globe, and as a company we would not have attracted clients from many countries, if we didn’t adopt social on an ongoing and committed basis. Your experiences around social media might be limited to family & friends style interactions on Facebook, but you may be surprised to discover how many new and fruitful relationships await you as part of your job search phase and future executive career, by embracing selected platforms and making engagement and production of content part of your normal work schedule. Part of the required mind set here of course is not to use ‘time’ as an excuse, and decide to prioritize this activity as part of your diary activities, not just in the job search phase but for your career going forward. Recruitment is changing. Are you ready? I was reading just recently some LinkedIn research stats, and globally it’s easy to see the rise of social media as a preferred recruitment method for executive jobs (along with a rise in referral schemes also). The question was along the lines of Out of the quality hires your organization made in the past 12 months, which of the following were the most important sources? The answer was social media, such as LinkedIn. Firms are now seeing social as a key way of attracting leaders who are ready for the digital age (vs. industrial age), seeing social as where the smart talent is to be found. Our client Wolfgang has been using social these past few months, and has seen a real tale up in interest and executive job offers. Through publishing original content on LinkedIn, he has noticed increased LinkedIn profile views from senior industry figures, as well as recruiters. In fact, one recruiter made a very positive comment on one article and a connection resulted, which led to a face to face meeting to discuss potential CEO/CFO roles. For Wolfgang, the activity of writing is not only bringing senior executive jobs to him, it is also helping him to reflect on his own role, and realise the massive contribution he’s making day to day. Engaging in social has spin off benefits for your professional practice and can also, without doubt, put you on the radar of many more potential recruiters, hiring managers, and industry leaders. 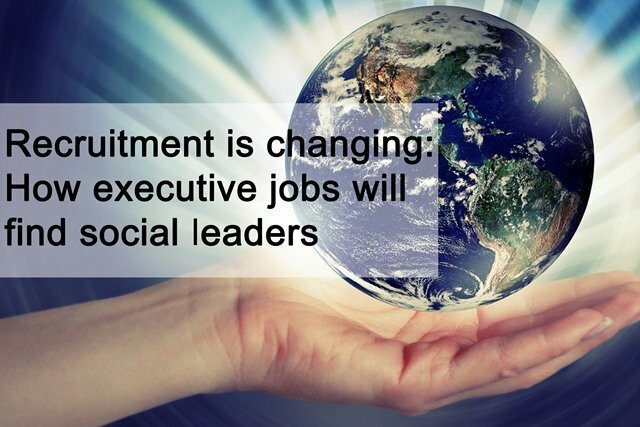 If you’d like to find out more about how to land your next role faster using social, I invite you to book your place on our forthcoming webinar, where I’ll be interviewing Executive Social Academy Founder, Jim Claussen, who we are proud to be partnering with to provide innovative social leadership training to keep you ahead of the curve. Places are limited to please be quick to reserve your space. Executive Connexions is pioneering a new approach to social media in senior executive recruitment, providing a practical and effective toolkit which even the most technically inexperienced can learn from and use. To find out more, join us on our Be Found webinar on Monday 25th January 2016. Be findable. Be engaged in social. Be published. Be hired. That’s the imperative.